^ a b c d e Gates, C. & Aune, K. 2008. Bison bison. The IUCN Red List of Threatened Species 2008: e.T2815A9485062. doi:10.2305/IUCN.UK.2008.RLTS.T2815A9485062.en. Downloaded on 20 October 2015. ^ a b c d e f g h i j k l Mary Meagher, "Bison bison," Mammalian Species, No. 266, American Society of Mammalogists, 1986, pp. 1-8. ^ Bork, A. M.; Strobeck, C. M.; Yeh, F. C.; Hudson, R. J.; Salmon, R. K. (1991). 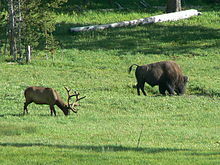 “Genetic Relationship of Wood and Plains Bison Based on Restriction Fragment Length Polymorphisms”. Canadian Journal of Zoology 69 (1): 43–48. doi:10.1139/z91-007. http://article.pubs.nrc-cnrc.gc.ca/RPAS/RPViewDoc?_handler_=HandleInitialGet&calyLang=eng&journal=cjz&volume=69&articleFile=z91-007.pdf. ^ Wyman, Travis (2002). 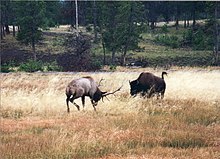 “Grizzly bear predation on a bull bison in Yellowstone National Park”. Ursus: 375-377. http://www.bearbiology.com/fileadmin/tpl/Downloads/URSUS/Vol_13/Wyman_13.pdf. ^ Hämäläinen, Pekka (2008). The Comanche Empire. Yale University Press. pp. 294–299, 313. ISBN 978-0-300-12654-9. http://books.google.com/?id=Fmh0AAAAMAAJ. ^ w:William Temple Hornaday's late-nineteenth-century research. ^ Staff (November 15, 2011). “Restoring a Prairie Icon”. 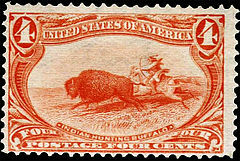 National Wildlife 50 (1): 20–25. 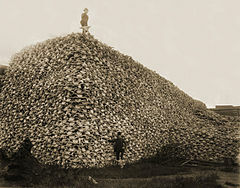 http://www.nwf.org/news-and-magazines/national-wildlife/animals/archives/2012/restoring-bison.aspx.